The two player Core Set is all you need to start your galactic adventure. It contains a rule book together with 128 beautifully illustrated cards (80 trade deck cards, 10 Explorer ships, two 10 card decks for each player to start, and 18 double-sided score cards) in a compact cardboard box. • Expandable – One deckbox supports 2 players. Use additional copies for multi-player games. The game changes in powerful ways with a new type of card — the Gambit. There are nine of them, and each player is given two of them at random to begin the game. When do you use your Gambits? When do you make your move? The wars continue, and now the stakes are even higher! For a good fleet commander, everything is an opportunity…and at times of war the law falls silent. 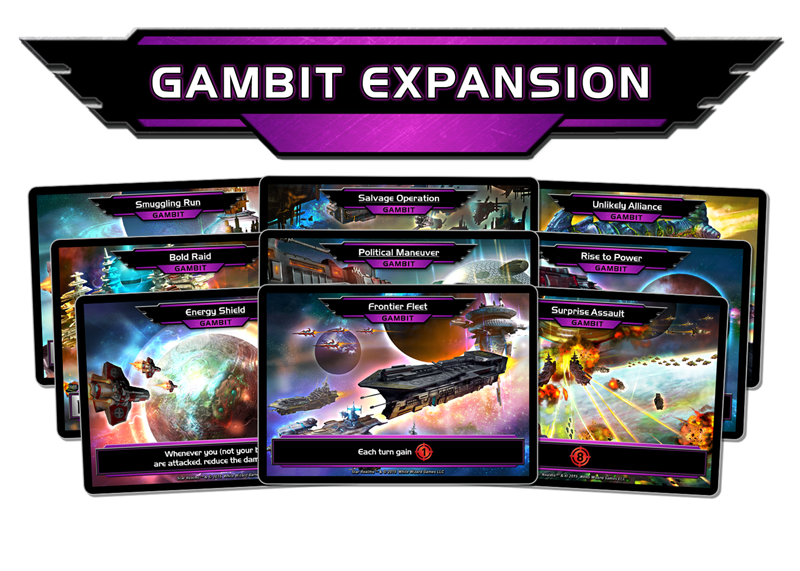 Take every advantage you can with Gambits, the first expansion for the award-winning Star Realms Deckbuilding Game. Gambit cards are dealt face down to players at the beginning of the game. You choose each number of Gambits every player will get (usually two), or you can give fewer Gambit cards to some players as a handicap. Players keep their Gambit cards face down in front of them until they choose to reveal them. Players may reveal Gambits at the start of the game or during their main phase. To reveal a Gambit, turn it face up. When a Gambit is revealed, you get powerful one-time or continuous abilities that can help lead you to victory. A sudden supernova throws occupied space into chaos. How will you deal with the Crisis? 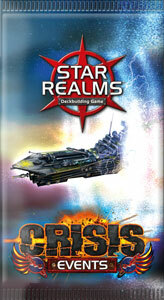 This explosive new expansion features four new packs of cards to increase your Star Realms’ play experience: Events, Heroes, Fleets & Fortresses, and Bases & Battleships. Add awesome new ships and bases to your Trade Deck, plus experience Heroes and Events for the first time! This pack contains 12 cards: 1 Black Hole, 1 Bombardment, 2 Comet, 1 Galactic Summit, 2 Quasar, 1 Supernova, 2 Trade Mission and 2 Warp Jump. This pack contains 12 cards: 2 Cunning Captain, 1 Admiral Rasmusson, 2 Ram Pilot, 1 Blob Overlord, 2 War Elder, 1 High Priest Lyle, 2 Special Ops Director and 1 CEO Torres. 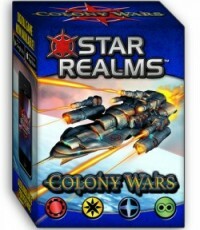 Designed by Hall of Famers Rob Dougherty and Darwin Kastle, Colony Wars can be played as a stand-alone 2 player game or combined with the original Star Realms Deckbuilding Game to support an additional 1-2 players. This box contains a complete 2 player game with rules and 128 cards, including an all new 80 card trade deck. 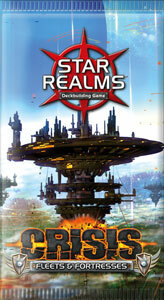 Colony Wars is the first standalone set for the award-winning Star Realms Deckbuilding Game. 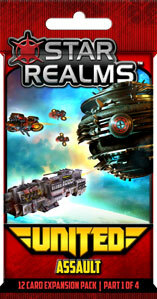 It features all-new Trade Deck cards in the factions you all know and love, and all-new abilities. 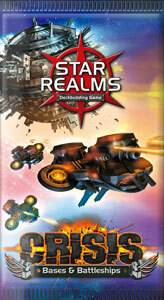 Star Realms Colony Wars is fully compatible with the Star Realms Core set, or may be played by itself. 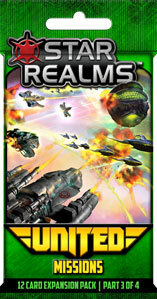 Can you master the latest strategies, and take your place in the annals of galactic history? 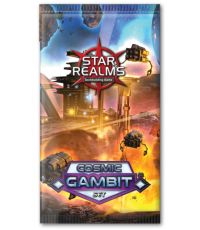 The second Gambits expansion for the award-winning Star Realms Deckbuilding Game. Harness the fortunes of war, and take advantage of the tranquility of peace. Master your fortunes and rule the cosmos! 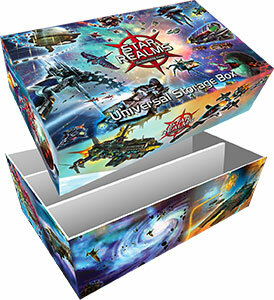 Star Realms United is a four pack expansion that features multi-faction ships and bases, powerful new heroes, and all-new missions cards that give players a new way to play and win! 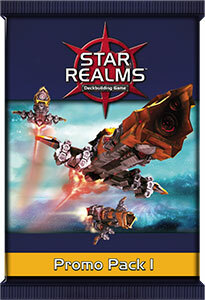 Each 13 card pack comes with 12 new Star Realms cards and 1 rules card. 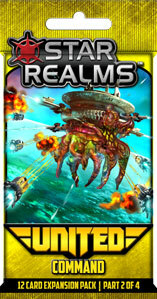 Star Realms: United Assault features all-new hybrid Ships and Bases. What happens when factions combine? You get strange and powerful new effects! This pack contains 12 cards: 2 Trade Star, 1 Union Stronghold, 2 Alliance Transport, 1 Embassy Base, 2 Coalition Messenger, 1 Lookout Post, 2 Blob Bot, 1 Exchange Point. 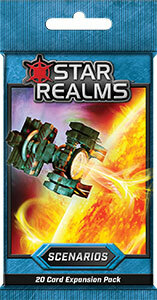 Star Realms: United Command contains another set of 12 all-new cards with the new multi-faction ships and bases. When the colonies go to war, which factions will untie to overcome the odds and emerge as survivors? This pack contains 12 cards: 2 Coalition Freighter, 1 Coalition Fortress, 2 Alliance Frigate, 1 Alliance Landing, 2 Assault Pod, 1 Unity Station, 2 Unity Fighter, 1 Union Cluster. Missions are an all-new card type that give players an alternate win condition. Each player is dealt three face-down. When a player fulfills the objective, they reveal the card and score the reward. A player may only complete a Mission once per turn, but when they score their third and final mission, they win the game! 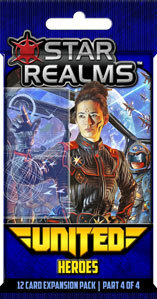 The Star Realms: United Missions pack contains 12 unique cards: Ally, Armada, Colonize, Convert, Defend, Diversify, Dominate, Exterminate, Influence, Monopolize, Rule, and Unite. Hero-worship exists, has existed, and will forever exist, universally among Mankind. – Thomas Carlyle. Star Realms: United Heroes gives us all-new Hero cards, some of which feature winners of the Star Realms Legend Series. Forge your future with the men, women, and gelatinous goo monsters that lead the galaxy! This pack contains 12 cards: 1 CEO Shaner, 1 Commodore Zhang, 1 Confessor Morris, 1 Hive Lord, 2 Chairman Haygan, 2 Chancellor Hartman, 2 Commander Klik, 2 Screecher. Ships and bases of legend can at last be a part of your arsenal! This pack contains 15 new-art versions of many of the most sought-after promo cards for use with the Star Realms Deckbuilding Game. Each pack includes: 2 Battle Screecher, 1 Breeding Site, 2 Star Market, 1 Megahauler, 2 Fortress Oblivion, 1 The Ark, 2 Battle Barge, 1 Starbase Omega, 2 Security Craft, and 1 Mercenary Garrison. When creating your star realm, be ready for the unexpected. The rules of conquest and commerce are constantly changing, and you need to change with them! 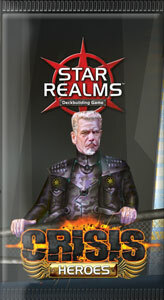 This pack contains 20 unique Scenario cards that change how Star Realms is played. Shuffle the Scenario cards, flip one over, and use the rules listed on that card for a new game experience! 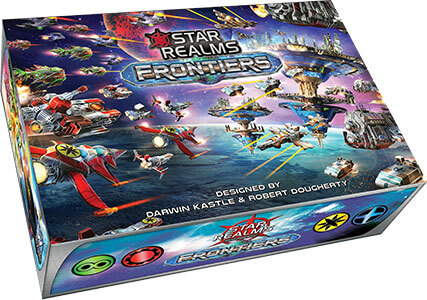 Designed by Hall of Famers Rob Dougherty and Darwin Kastle, Star Realms combines the fun of deckbuilding games with the interactivity of trading card game-style combat. As you play, use trade to add new ships and bases to your deck. When played, those ships and bases generate powerful effects, additional trade, and combat to attack your opponent and their bases. If you reduce your opponent’s score to zero, you win! This box contains a complete game for 1-4 players with rules and 152 cards, including an all-new 80-card trade deck and 8 oversized solo/co-op challenge cards. 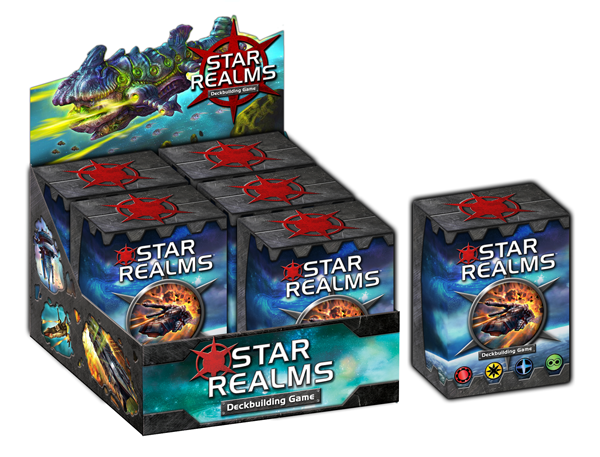 To expand for more players, simply add an additional Star Realms Core Set or Colony Wars deck for 1-2 additional players.